C22 Ap sensor voltage is not within the following range. note that atmospheric pressure varies depending on weather conditions as well as altitude. Take that into consideration when inspecting voltage. Clogged vacuum passage with dust. Ap sensor circuit open or shorted to ground. Ap sensor circuit is open or shorted to vcc or ground circuit open. Ap sensor circuit is shorted to ground or vcc circuit open. P1450 H Sensor voltage is higher than specified value. L Sensor voltage is lower than specified value. Remove the starter relay from the bracket. Check the ap sensor coupler (1) for loose or poor contacts. If ok, then measure the ap sensor input voltage. Disconnect the ap sensor coupler. Measure the input voltage between the r wire and ground. If ok, then measure the voltage between the r wire and b/br wire. Is the voltage ok? Go to step 3. 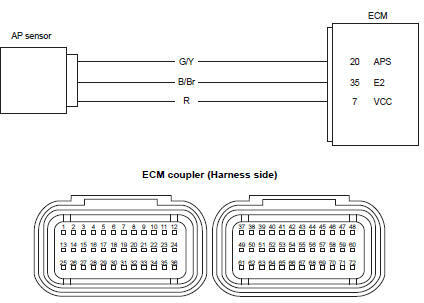 Loose or poor contacts on the ecm couplers. Open or short circuit in the r or b/br wire. If ok, then check the ap sensor lead wire continuity. Check the continuity between the r wire and g/y wire. If the sound is not heard from the tester, the circuit condition is ok. Disconnect the ecm couplers. Refer to “ecm removal and installation” in section 1c . 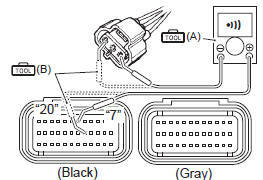 Check the continuity between the g/y wire and terminal “20”. If ok, then check the continuity between the b/br wire and terminal “35”. Is the continuity ok? Go to step 3. G/y wire shorted to vcc, or b/br wire open. Check the continuity between the g/y wire and ground. Also, check the continuity between the g/y wire and b/ br wire. If the sound is not heard from the tester, the circuit condition is ok. Check the continuity between the r wire and terminal “7”. Also, check the continuity between the g/y wire and terminal “20”. Is the continuity ok? Go to step 2. R and g/y wire open, g/ y wire shorted to ground. Connect the ecm couplers and ap sensor coupler. Run the engine at idle speed and measure the ap sensor output voltage between the g/y wire and b/br wire. Check the vacuum port for crack or damage. Open or short circuit in the g/y wire. If vacuum hose and lead wire are ok, replace the ap sensor with a new one. Refer to “ap sensor removal and installation” in section 1c . Remove the ap sensor. Refer to “ap sensor removal and installation” in section 1c . Connect the vacuum pump gauge to the vacuum port of the ap sensor. 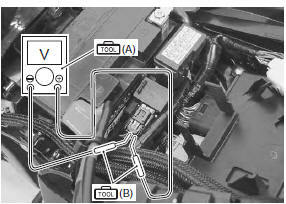 Arrange 3 new 1.5 V batteries in series (1) (check that total voltage is 4.5 – 5.0 V) and connect (–) terminal to the ground terminal “b” and (+) terminal to the vcc terminal “a”. Check the voltage between vout terminal “c” and ground. 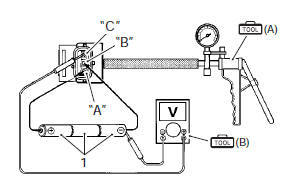 Also, check if voltage reduces when vacuum is applied up to 53 kpa (400 mmhg) by using vacuum pump gauge. 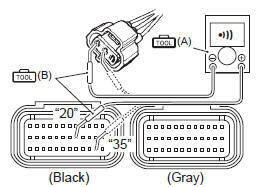 G/y, r or b/br wire open or shorted to ground, or poor “7”, “20” or “35” connection. If check result is not satisfactory, replace the ap sensor with a new one. Refer to “ap sensor removal and installation” in section 1c .